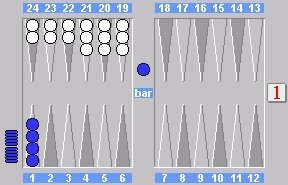 You don't have to play backgammon for a long time before the following backgammon position might occur. It is close to the end of a game. Somewhere in the game BLUE started to bear off his checkers, until by an unfortunate luck WHITE managed to hit one of BLUE's checkers. Only a few moves after that WHITE has ended up with a closed board with a perfect distribution of his spare checkers and BLUE being trapped on the bar. Now from being a certain winner, BLUE is now being more and more nervous. But should he be? Is BLUE far from the victory or is he still a big favorite? Read this text and will and up having an easy tool for determine these kinds of positions. I've called it "Michael's 432 Rule". 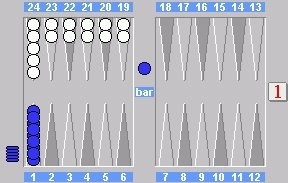 When "the player with one man on the bar" has 4 men left on his ace point, the probability of "the player with the closed board" winning the game is between 30% and 20%. Notice the 4-3-2 sequences of numbers, hence the name of the rule. Depending on the placement of the spare checkers of "The Player with the closed board" determines whether it has to be 30% of 20%. If the distribution is perfect with a spare on the 4, 5 and 6-point then the high value, 30%, should be used. If the spares all are situated on the ace point the 20% should be used. Looking at the position above, WHITE has an excellent distribution, so using the rule will give WHITE a 30% chance of winning. So in the current position BLUE is still a big favorite though. But what if BLUE had more than 4 checkers on the ace point? Easy! The rule is valid from having 4 to 9 men on the ace point. This means that with BLUES having 9 men on the ace point, WHITE will be between 70% and 80% favourite as shown below. An example of a bad distribution of spare checkers is shown below. Below 4 men and above 9 men on the ace point, the rule is not accurate enough to be used. So next time you find yourself on the bar looking at a closed board you will always know the probability of winning the match. Of course you would also find yourself at the other side of the table while closing out the opponent. Michael's 432 rule applies for both sides.